Main Events and InterBox are proud to offer to boxing fans a quality card with a championship flair this January 30 at the Bell Centre. The event, which will feature the unified light heavyweight world championship grudge match between WBA, WBO and IBF title holder Sergey Kovalev and former world champion Jean Pascal, will also put two other titles on the line : Dmitry Mikhaylenko against Ray Robinson for the USBA welterweight belt as well as Renan St-Juste against Francis Lafrenière for the International IBF middleweight title. “We asked our team to put together a balanced and diverse card that would showcase our up-and-coming talent,” said InterBox Vice President Pierre Duc. To kick the evening off, Quebec-based hard puncher Steven ‘Bang Bang’ Butler (13-0-1, 11 K.O.) will meet against Angola’s Antonio Hoffmann (13-0, 9 K.O.). Just like Eye of the Tiger Management’s young local rookie, Hoffman is a fierce competitor who has a devastating punch and is quite gifted technically. After another impressive performance in front of his fans where he beat Quebec-based boxer Frank Cotroni in spectacular fashion, Sorel’s David Théroux (8-1, 5 K.O.) will be back in the Bell Centre ring on January 30 to face Mexican boxer Juan Armando Garcia (12-2-2, 5 K.O.) in a six-round middleweight bout. For his part, Sébastien Bouchard (11-1, 4 K.O.) will be back in action to fight Poland’s Damian Mielewczky (9-1, 7 K.O.) at 160 pounds. 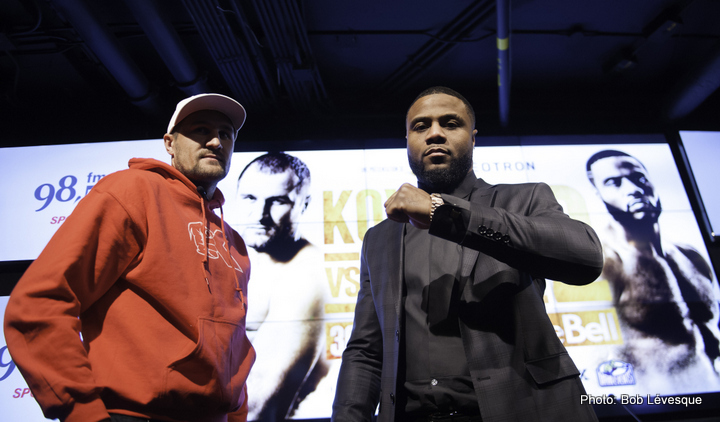 The grudge match for the unified light heavyweight world championship between Sergey ‘Krusher’ Kovalev and Jean Pascal, a Vidéotron presentation in collaboration with Mise-O-Jeu, will be televised live in the United States on HBO World Championship Boxing ® beginning 9:45pm ET/PT. The HBO telecast will open with a 10-round welterweight contest between Dmitry Mikhaylenko and Ray Robinson. In Canada the event will be available on pay-per-view TV, please consult with your local cable provider. The card is promoted by Main Events and InterBox in association with German Titov Promotions. Tickets are on sale on at www.evenko.ca, at Centre Bell box office and at Club de boxe Champions in Montreal.